Bullies like to pretend that their abuse is harmless. That it’s just a joke. It isn’t. Here’s why. My friend Kathleen Bartle, who is a conflict consultant wrote a wonderful piece about why bullying is not the same as banter and 3 ways you can tell the difference. 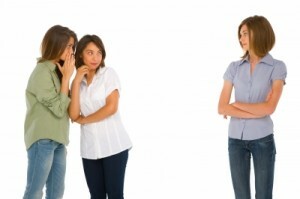 Here is a link to her article: http://www.kathleenbartle.com/bullying-is-not-banter-3-signs-that-its-not-a-joke/ I also recommend you purchase her book – Stop Arguing & Start Working: 6 Steps to Being Confident, Calm and Capable During Difficult Conversations at Work . If you are too lazy to link there – here is the gist of it. 1) Banter is reciprocal. It has a back and forth and a give and take. If it’s one sided, it’s not banter, it’s bullying. 2) There is a single target. If the person bantering gives crap to everyone, they are an equal opportunity abuser. However, if they consistently target a single individual for this sort of abuse, it isn’t harmless, it’s bullying. 3) Is it personal? Banter is light back and forth. It isn’t mean to harm or demean another person. It’s meant to lightly tease. Emphasis on light. If the comments are personal and demeaning and make the person feel bad about themselves, it isn’t banter, it’s bullying. If someone is behaving this way towards others and when someone complains says – it’s just a joke, don’t take it so seriously, take it seriously. It’s not banter it’s bullying. If someone is honestly joking and they find out they have hurt someone’s feelings, their first instinct is to apologize! Bullies don’t apologize. They deflect attention away from their own inappropriate behavior onto the victim while simultaneously trying to gaslight them to make the victim the problem because “they are too uptight to take a joke.” It’s not a joke and it’s not ok. It’s not bantering, it’s bullying. Don’t let a bully tell you otherwise.